Most writers struggle to get attention for their novels; grateful for a review or two in the national press or in the women's magazines, we do our best to get coverage that will draw attention to our books. We write feature articles and reach out to literary bloggers: we post about our books on Facebook and Tweet. Anything to try and make our work visible and discoverable in the sea of published books. But this week I got help from a completely unexpected quarter, when Christopher Nolan's new blockbuster, 'Interstellar', came out. I went to see it with a girlfriend who, as the film began, suddenly grabbed my arm and let out a gasp. And I gasped too because the camera was tracking along a book shelf, on which, clearly visible, was my third novel, 'Out of the Blue'. It was there for a second or two at most, but we had both seen it and I knew that millions of other cinema-goers would see it too. I was of course thrilled beyond words - what a fabulous plug! - but I was also mystified as to why it was there. Among the other novels on the shelf I had recognised 'Time's Arrow' by Martin Amis, and 'One Hundred Years of Solitude' by Marquez. By the end of the film I could see why those titles might have resonated with Christopher Nolan. 'Interstellar' is about space and time travel, and about astronauts, cryo-frozen, sleeping their way through their intergalactic voyage. But why 'Out of the Blue'? It has the feeling of the sky of course, but that's the only reason that I can think of to make it fit with Nolan's themes. Since then I've seen online forums that debate the meaning of the featured books. Someone pointed out that 'Out of the Blue' was published on February 1st 2003, which was the day of the Columbia space shuttle disaster. 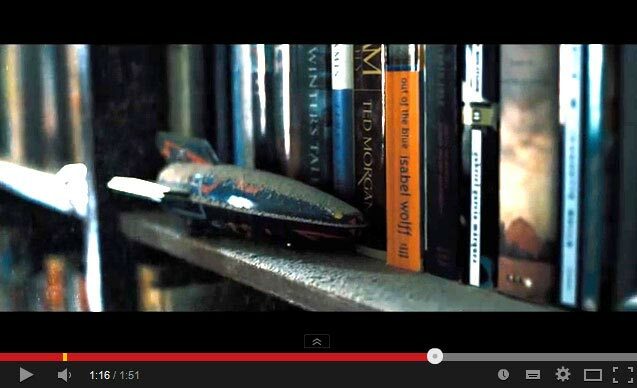 I took my courage in my hands and tweeted to @Interstellar, saying that I was of course delighted to see my book at the start of the film, but would love to find out if there was any particular reason for it being there. If I get a reply, I shall let you all know.